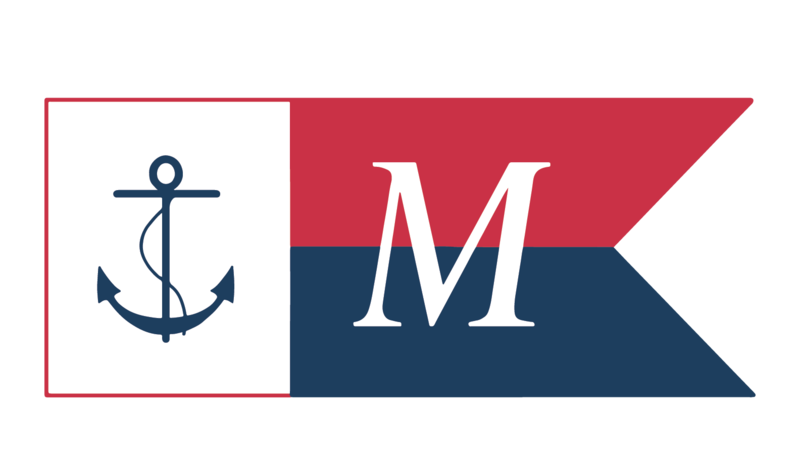 One of the largest artifacts that we like to talk about at the Percy & Small shipyard is not here. 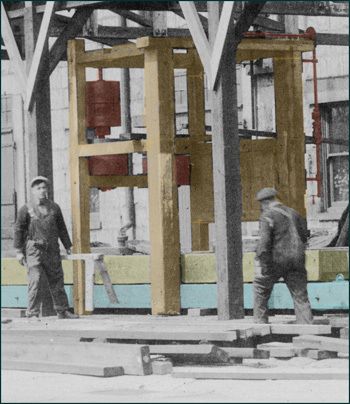 Sitting idle after the yard's slow-down in 1920, the large wood milling machine known as the Daniels planer was dismantled in 1927, sent to the Boston Navy Yard, and re-assembled to shape large timbers during a rebuilding of USS Constitution. Attempts to find 'our' Daniels planer at the Navy Yard have proved fruitless. In a rare view taken at the Boston Navy Yard in 1927, collected by Lieut. John Lord, the Bath native in charge of the refit, 'our' Daniels planer can be seen nearly re-assembled after its move south. Among the bustle of workers and new shed timbers, the stationary planer's bed track can be seen(tinted blue); its rollers to carry the moving planer table (yellow); the upright wooden frame of the planer's frame and a partition to protect the operator (orange); and the few metal moving parts, such as the clutch drums and the crank for adjusting the cutter (red). The actual cutterhead is either obscured or not mounted yet. Luckily, in 1982 we acquired for the Mill another contemporary Daniels planer, which now sits in approximately the same location. Large though it is, it is but a diminutive cousin to the original. 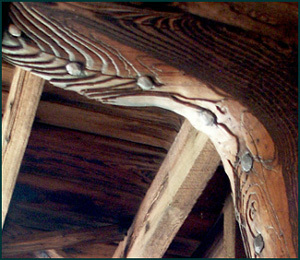 The Daniels planer was used to plane flat the irregular sides and angles of ship timbers, like the ship knee in the foreground (above). 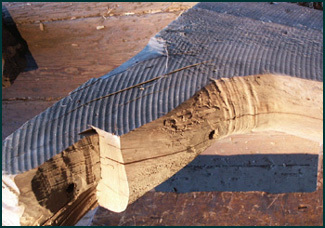 This was accomplished by dogging the log to the moving table of the planer and feeding it through the horizontally rotating cutterhead. 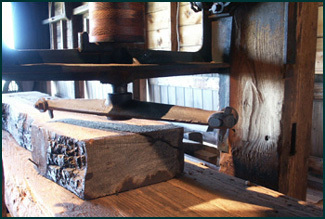 In this close-up of the planer's inner works (below), note the cutterhead with the small projecting toothlike blades at each end; then note the eroded grain of the wooden post of the planer's frame to the right. 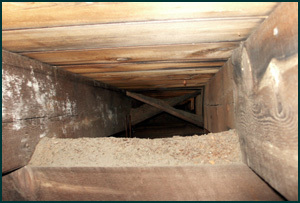 Enormous amounts of waste wood were flung into the post and out beyond the spinning machinery, to spray in a deafening richochet against the walls and ceiling. 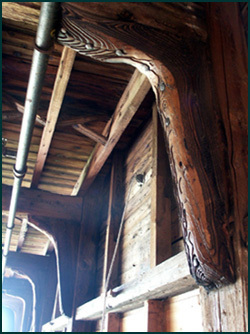 A closer look at the ship knees bracing the interior of the Mill at Percy & Small reveals startling effects. Like driftwood subjected to blowing sand, the harder annual rings of the softwood knees have been blasted into relief and polished. These flung chips could be lethally large if the planer was set aggressively; it could remove up to a 2" thickness of wood at a single pass. 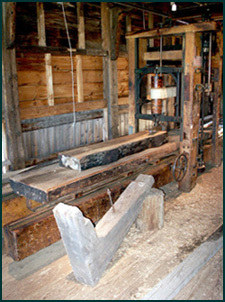 This photo from the Boston Navy Yard series records the first live-oak floor timber or futtock run through the now fully enclosed machinery shed. 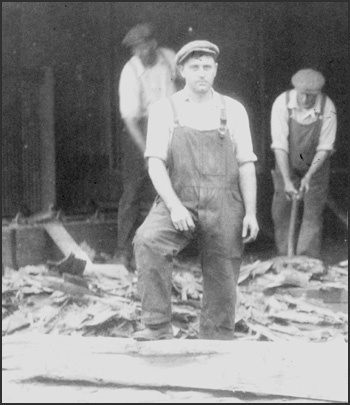 'Our' Daniels planer sits in the gloom on the left, and the men are shoveling out the waste wood. This guy may be thinking that it is time to hang a heavy canvas curtain to contain such splinters before the next piece is run through. The post (left)was partly protected with sheet tin, but that was punctured in turn, leaving the three upper irregular depressions. 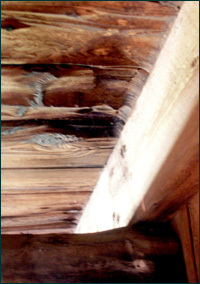 The softer wood (right) surrounding the more resistant knots of the ceiling has worn over an inch deep. These finer chips sprayed upward in a cloud and accumulated on overhead beams of the Mill, where the careful observer can still see them, undisturbed to this day. So, even if it has vanished, by careful study of its impact, literally, on the wooden surfaces nearby, some sense of the Daniels planer's snarling dominance of the Mill and its workers may be gleaned.